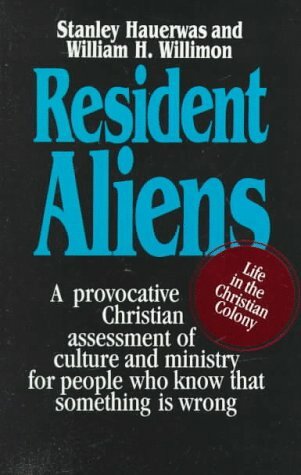 Resident Aliens: Life in the Christian Colony: A provocative Christian assessment of culture and ministry for people who know that something is wrong, by Stanley Hauerwas and William H. Willimon, Abingdon Press, 1989, 175 pp. After borrowing its title for the opening sermon in my latest sermon series (entitled “Living in Tents”), I finally sat down to read this now-classic work of theology and ethics. It was difficult to read it without all the baggage of accumulated years of references to it, the associations with missional theology, the contentions over Christian superiority and more. However, it was rewarding to finally read this influential work for myself. In this book Hauerwas and Willimon make the case (now familiar to many) that Christendom is dead. They argue that we should rightfully conceive of the church as a colony in alien territory. A colony has a mission—to build and grow its unique culture in the midst of foreign land, and to expand its influence over the people and environment around it. The authors argue that the church in the world is just such an entity—cultivating a countercultural set of values, trying to raise our young people into that culture, and trying to expand our influence over the people around us. There is much in this book that is interesting and merits attention, and much attention has been paid in the two decades since its publication. The recognition of the church’s diminished influence, the call to see ourselves as countercultural, the attention to passing on unique values are worth repeating. However, the overarching metaphor of colonization remains troubling. In the wake of centuries of violence in the name of colonization, in a world where “colony” most often refers to the displacement and devaluation of local custom and destruction of all who disagree, I most certainly do not want to think of myself as a colonizer. It is also the case that extreme conservative and fundamentalist branches of Christianity have already adopted this self-identity as colonies, withdrawing from collective social institutions and isolating themselves and their children from wider American culture. I do not think this has been very good for democracy, nor good for Christianity. One of the things that surprised me the most in this book was the strident tone it took throughout. Hauerwas and Willimon rail against both Niebuhr brothers, common mainline Protestant wisdom and general practices of congregations. It is that stridency that is both appealing and disconcerting. I want to passionately agree with many of their insights, but I am distrustful of their disregard and blatant dismissal of so many who came before them. Can Christians Believe in Ghosts? This is one of the most frequent theological questions I get asked. If you believe in the Holy Spirit, can you also believe in spirits? If you believe in resurrection, in heaven, in hell—can you also believe in ghosts? 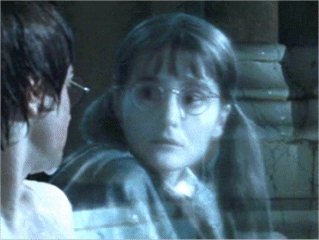 Moaning Myrtle, one of the ghosts in Hogwarts Castle, and sometimes friend to Harry Potter. I usually field these questions from those who are dying and those who have recently lost loved ones, and they arise in response to a direct experience that feels like an encounter with someone beyond the veil. It’s not anything like Casper the Friendly Ghost, or Poltergeist, or even the friendly haunts from Hogwarts. Almost always, people just describe a presence that they can feel, or sometimes a voice they hear or a vision that they see. When people are dying, they often tell friends and loved ones (and their pastor) about visits from loved ones who have already died. People will detail elaborate conversations they have had with their parents or spouses or children who are long deceased. These conversations seem as real to them as conversations with living family members. My own grandmother, in the final days of her battle with Alzheimer’s Disease, described the “red-headed angel” that came to see her, and we all thought of my aunt, her daughter, who had lost her battle with breast cancer a few years earlier. Those who have recently lost loved ones—especially a spouse or parent—will describe feeling, hearing or seeing that loved one with them again. These encounters often come in the night, either through a sophisticated dream or a sudden awakening to the brief sight or sound of the person in the room. Other times, it just feels like the person is there, even though the bereaved person knows that they have died. I have had countless people share messages from their mother, father, wife or husband. Almost always, these visits provide a sense of love, peace, connection and healing to the grieving heart. In the movie Ghost, Patrick Swayze returns to visit his beloved Demi Moore and help her heal from grief. People tell me these stories to see if I think their encounters are real, to test if they are losing their minds, and to ask whether believing in the reality of these experiences is somehow incompatible belief in the reality of God and God’s promise of resurrection. As a pastor, my answer to all of the above questions is always unequivocal. Yes, I believe them when they tell me about the power of these experiences. No, I don’t think they are crazy. No, I don’t think believing you’ve seen or felt the presence of someone who has died is incompatible with Christian theology. Are these “ghost stories”? Who is to say? We do not have sophisticated, subtle language to discuss our experiences that touch the space between this life and the next. From earth, the boundary between life and death seems impermeable, but we have no knowledge about how that boundary works from the other side. No one knows for certain what happens when we die. It is all a matter of faith and speculation. At the heart of the Christian faith is the promise of the resurrection—that Jesus somehow was raised from the dead, which means that death does not have the last word, that there is life beyond this life, and we need not fear the grave. Does that resurrection mean that our beloved ancestors return to us at the time of our crossing over or theirs, to comfort us? Or is it all something our minds concoct in times of stress and distress? I don’t claim to know or understand. I certainly don’t find anything in Christian theology that precludes the possibility, nor anything that affirms it. Who am I to say that it is not of God? As a pastor, I am grateful for those grieving loved ones who have these encounters with spirits, because their pain is eased and healing begins. Maybe it is all just the one Holy Spirit, the Comforter, who comes to us in many forms to bring consolation. 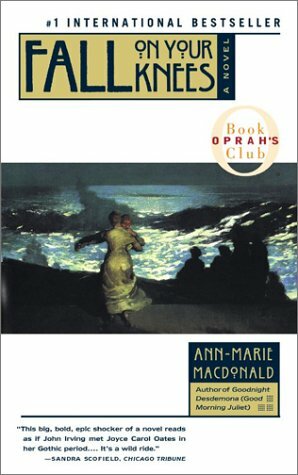 Fall on Your Knees, by Ann-Marie MacDonald, Scribner Paperback Fiction (Simon & Schuster), 1996, 508 pp. This is by far the best novel I have read in a long time. The review on the front cover describes it as a “big, bold, epic shocker of a novel,” and that is a great description. 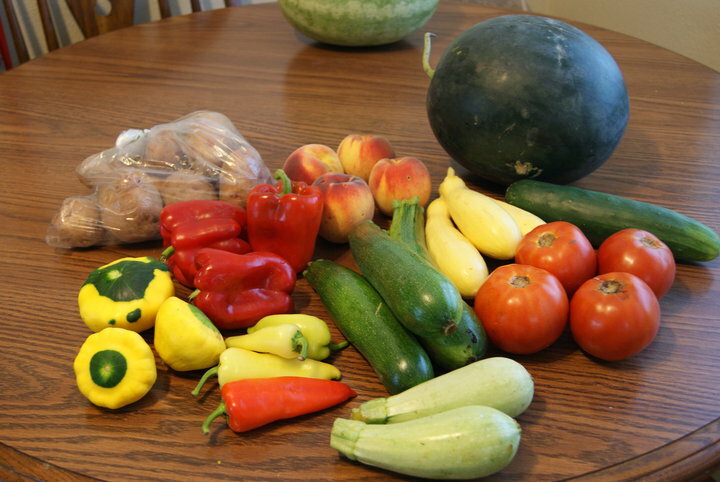 It is epic, following a single family across generations, and it is beautiful. The story begins with James, child of Irish immigrants determined to make something of himself in the world beyond tiny Cape Breton Island. He meets Materia, child of Lebanese Catholic immigrants, and elopes with her as his child bride (age 13). They have a daughter Kathleen who seems genius, perfect and gifted–but meets a tragic end. More daughters follow, but there are secrets and broken relationships and lost dreams in abundance. There are sacrifice and selfishness, vanity and self-denial, sexuality and suffering, faith and martyrdom. Fall on Your Knees was simply a great story. The characters were rich and compelling and broke free from any two-dimensional stereotype. The unfolding of the family history was unconventional and compelling. The novel deals with issues of isolation and cultural division in immigrant families, without seeming pointedly political. It grapples with strange expressions of sexuality and broken-hearted children without lapsing into pity or despair. In the end, it was the power of the characters that made this novel so good. They refused to be victims of their circumstances. Each of James’ and Materia’s daughters found a way to move forward into life, even when everything around them tried to pull them back. Their choices were sometimes brutal and painful and twisted, but they forged a future for themselves and for each other with a dogged determination that made you cheer for them even when you knew they were destroying themselves in the process. Ann-Marie MacDonald has created a world, full of real people you come to love and loathe. I was so sad when the story ended, and there was no more to know of them. Fall on Your Knees is magnificent. Read it. 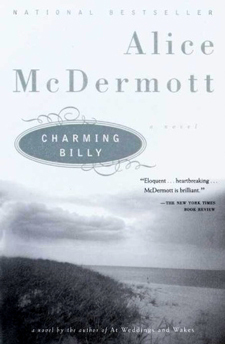 Charming Billy, by Alice McDermott, Delta Trade Paperbacks, 1998, 243 pp. Charming Billy was not the light, quick vacation read I was looking for when I checked it out from the library. Instead, it was an intense, pain-stakingly constructed look inside the life of an alcoholic, told from the perspective of his closest friends. It was a work of art, deep and poignant. The story begins at Billy’s funeral luncheon, with all his friends and family gathered around for a formal meal at a restaurant. They all begin to talk about his life. The novel unpacks, ever so slowly, what happened to Billy—how he went from a jovial young man who was the life of the party to an alcoholic who could end up nearly dying in a ditch. The narrator is the daughter of Billy’s best friend Dennis. Dennis has witnessed Billy’s entire life, and he was especially close during the critical turning points of tragedy, betrayal and misfortune. We rarely hear the tales in Dennis’ own voice, but eventually all comes into the light. The story is revealed like scraping a coat of paint from a window pane—with each stroke, you can see just a tiny bit more, until everything becomes clear. The title is evocative and accurate. Billy is indeed a charming guy, even through his addiction. The novel itself seems to “charm” him, summoning his character and history out like a venomous snake in a basket. It was an intense read. I would recommend it to anyone seeking insight into the lives of alcoholics, their families and friends. McDermott captures the tension between wanting to aid someone in the grips of addiction as illness, and the desire to punish them for their bad decisions in hopes it will inspire better ones. She details the struggles of family and friends who love Billy even as they watch him self-destruct, and the sense of helplessness and weariness they share. We could all tell ourselves tonight that we didn’t do enough, Maeve. I had the thought myself when Dennis called me the other day and told me Billy was gone, and how they found him. I thought, Dear Lord, what could I have done? We could all of us say today that if we loved him it was a poor sort of love, or else his life wouldn’t have ended as it did. But you know, if I said it to you, Maeve, if I said that I failed him, … or if any one of Billy’s friends said it, you’d be the first to tell us it wasn’t true. And you’d mean it. And you’d be right. Billy succumbed to an illness we couldn’t cure in time. It wasn’t a failure of our affections, it was a triumph of the disease. That’s the very thing you would tell any one of us and it’s the thing you have to believe yourself. Of course, it mattered. Everything you felt, everything you did for Billy mattered, regardless of how it turned out. It’s good to hear such positive words from a priest, even a fictional one. That’s how the whole novel goes. Just hauntingly simply and real. Billy may have been charming, but alcoholism never is. Hello. This is Pastor Jennifer. I’m calling because I have some news I need to share with you. At least once a week I make a telephone call that starts out that way. Sometimes I get to call with good news. Then there are the hardest calls of all. He died last night. After such a long illness, there is peace. But I know you will miss your lifelong friend. She was rushed to the hospital, but they could not revive her and she died. We’re all in shock. There are no words. I’m so sorry. Bearing news, whether good or bad, is a weighty responsibility. I carry the news in my body, in my mind, until I am able to share it with all the people who need to carry it as well. Good news is a helium balloon. I have to hold tight so it doesn’t fly away too quickly. Bad news is a load of bricks. The more painful it is, the heavier it feels to carry. Tragedy is measured in tons, not ounces. Sometimes I wish I did not have to burden others with it. When people answer the telephone, innocent and unaware of the reason for my call, I know that what I am about to tell them will change the course of their day, sometimes their lives. I will never forget the times I have helped bear news to young children that a parent has died. I did not realize, before I became a pastor, how often I would be a messenger bearing news for the community. And yet it is fitting. I entered the ministry because I wanted to bear news—Gospel (which mean good news), the message that God loves us and abides with us in all things. When I make a call bearing news of life and death in this world, I do not bear only that news. I hope I am also always carrying, and delivering, the good news of God, who loves us, heals us, forgives us, saves us and walks with us in the shadow of death. In all things, I hope to bear God’s good news that can overcome fear and drive away despair. Maybe I should just pick up the phone and start calling people to share that news. 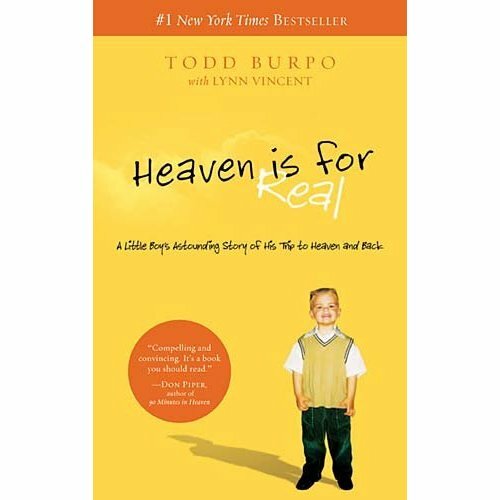 Heaven is For Real: A Little Boy’s Astounding Story of His Trip to Heaven and Back, by Todd Burpo with Lynn Vincent, Thomas Nelson, 2010, 163 pp. One of the folks from my church gave me this to read. She was moved and captivated by the little boy’s story, and by the testimony he gave. In the story, little Colton Burpo, the three year-old son of a Wesleyan pastor in rural Nebraska who nearly loses his life after a burst appendix. Months later, Colton begins to talk about his experiences during his days and weeks in the hospital, clinging to life as he tries to overcome the infection from the appendix. What he talks about, however, is not about doctors and nurses and caregivers. He talks about an otherworldly presence, about Jesus by his side, about seeing them across the hospital during his surgery, and even about long-dead loved ones that he has never met, who tended him during the surgery. The tale is told with awe, as Colton’s story unfolds and expands over the course of a year or more after his surgery. There are many of these kinds of stories about heaven out there. This one is a fairly good one. There are always people who are eager to cling to these stories and promote them as proof of heaven’s existence. (How could a little boy know so much about Jesus unless he was there? How could he have identified people who he’d never met?) There are also always people eager to debunk them as nonsense by poking dozens of holes in the details. (Why does a little boy’s vision of heaven match perfectly with evangelical theology? His father, who is writing the story, must have influenced him. In a pastor’s house, of course he thinks his experience was Jesus.) People on both sides of that debate will find plenty of ammunition in this book. I tend to be more of a debunker than a believer. The initial story Colton told was very compelling, but as the chapters unfolded and the details got both more specific and more aligned with evangelical theology, I was less intrigued. Here’s what I believe: “heaven” is for real. There is life beyond this life. The God who created us loves us, and will love us and care for us even beyond death. I don’t know anything about what that next life will be like. I am unconvinced by those who claim they do. Our conceptions of resurrection may differ, but knowing that it is for real, that we can confidently look death in the face and claim that it is not the end–that matters a great deal.